AUSTIN, Texas -- Former Pennsylvania governor and U.S. 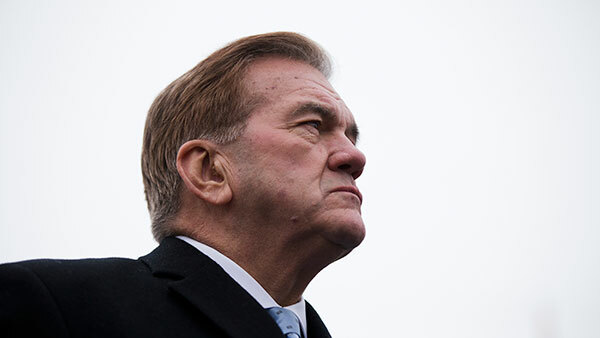 Homeland Security Secretary Tom Ridge was in critical condition Thursday after undergoing an emergency heart procedure at a hospital in Austin. A Ridge spokesman said the 72-year-old Ridge, Pennsylvania's Republican governor from 1995 to 2001, was attending the Republican Governors Association conference when he called for help at his hotel at about 7 a.m. The spokesman, Steve Aaron, said Ridge underwent a cardiac catheterization at Dell Seton Medical Center at the University of Texas. He said Ridge has been responsive with physicians. Ridge was the nation's first homeland security secretary, serving under President George W. Bush until February 2005. He left the governorship after the terrorist attacks of Sept. 11, 2001, to join the Bush administration. He managed the far-flung department, composed of 22 agencies and about 180,000 employees by the time he left. He became known for color-coded terror alerts and advocating "disaster kits," triggering a 2003 run on duct tape and plastic sheeting. Since leaving government, Ridge has headed Ridge Global, a firm that advises on cyber security, international security and risk management. Aaron said Ridge was attending the conference for Ridge Global. Ridge and his wife, Michelle, live in Bethesda, Maryland. Ridge is a U.S. Army veteran of the Vietnam War. He was a county prosecutor and a six-term congressman from Erie, Pennsylvania, before being elected the state's governor in 1994. As governor, he led an anti-crime push that included a special legislative session, cut taxes, established charter schools and deregulated utilities. He also signed off on a massive increase in pension benefits for state workers and teachers, a decision that continues to cause problems for state and local government budgets.